By The Globe and Mail Inc. Seller: The Globe and Mail Inc.
© The Globe and Mail Inc. The content is great and the interface is mostly fine but I’m always accidentally opening a pop up that takes me to Safari. It’s very annoying and distracts from an otherwise great app. The Globe and Mail is one of Canada’s oldest and most respected newspapers. It is an excellent source of news in. Canada. The Globe and Mail still gives meaning to journalism. Balanced, detailed reporting about a wide range of international topics. As a whole the depth of reporting is on par with, and a good compliment to, The NY Times with the upside of a lot less reporting on Trump and the incompetence of the US political scene...there’s a whole lot happening outside of the US and the Globe helps to keep me informed of that. I’m a Canadian who has lived in the US for many years. The Toronto Globe and Mail is easily on par with higher profile US papers such as the NYT and Post. Americans looking to broaden their perspective of US news by reading a foreign paper should consider this paper as it has clearly “stepped up” - becoming both Canada’s national paper and world class source for news. The Ads are a disaster. Every time you read an article the ads click involuntarily. This is a huge annoyance. The Globe and Mail is a world-class source of news and analysis. If I want to educate myself about a situation, the Globe is always one of my top picks. For example, their explainer on all the players in Syria outlines Each different group and its priorities and alliances etc. one annoyance is that certain articles are behind a $30/month paywall. A bit steep for an American who won’t use a lot of that information. 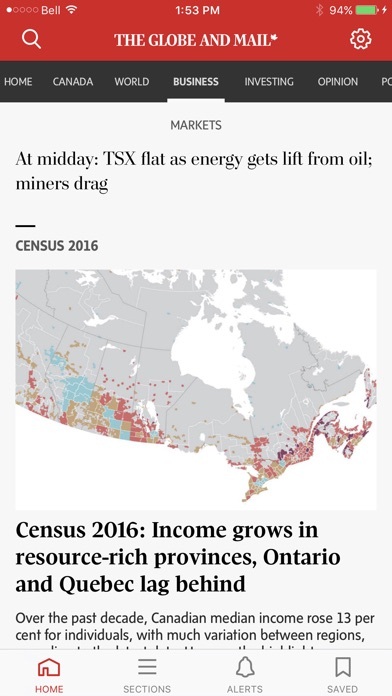 However I am noticing that they seem to be putting mostly Canadian and mostly financial type articles behind the paywall now. Which leaves the international coverage mostly free Highly recommended for a non-partisan view of international news and politics as well as a window into the Canadian mind set on Trump and American politics. In typical fashion you update the app and don't test it first. Crashes on launch. Useless !!!!! A wonderful newspaper that too few Americans know about. I am a paying subscriber. However, I still have to deal with pop-up ads that pop open in Safari after an errant touch on the screen while scrolling through an article. Aggravating. I find the news in the Globe and Mail to be clear and succinct. It is an excellent source for the news ..here and around the world. The app gives a good overview of major news stories in Canada along with diverse opinion columnists. Unlike a competing app, it plays nicely with my iPod. Are you listening, G&M? Your app is terrible, change it back! I really regret updating this app the other day. It is horrible. Before I could select the sections I wanted to read. Not now! No choices at all. The font is too small to read as well. PLEASE put it back to the way it was. This too old to be a Canadian from south of the border appreciates how flawlessly this app works. 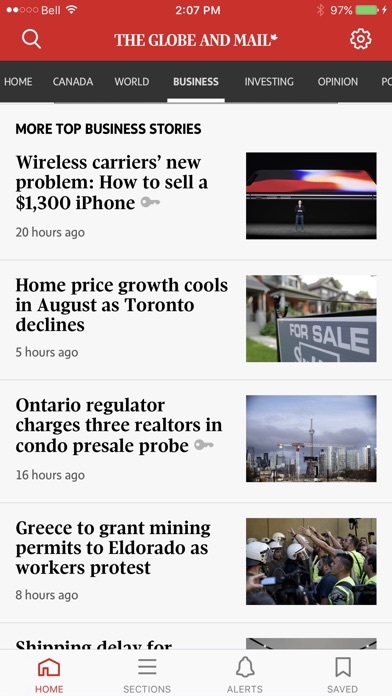 I am impressed at the coverage of news in and around Ontario and around the rest of Canada. This app, beyond its lack of content, is not accessible to those with low vision. The previous app allowed users the ability to increase font size, this app has no such features. Those with visual impairments must now resort to other local news outlets. Really disappointing. I enjoy reading BBC, The Economist and der Spiegel along with The Globe and Mail. Top journalism and easy to use app -similar to BBC. And I like the ease of sharing too. This app is easy to use. Navigation is slick, pictures are great and it is very current. Well done! As an American, I have always admired The Globe's objective and succinct reporting, especially on issues of both Canada and the United States. I use The Globe as my primary news source to stay up-to-date. With each day of viewing I am afforded views from the extreme left. I am pleased that no effort is made to permit other views. Great reporting on relevant content. Great contributors, some of the best reporting available. The app makes it all available, easy to navigate, no fuss, minimum data use, no irrelevant graphics, plus quick downloading! I use it above all the others I've tried. Highly recommended! Awful! Constantly crashing. Completely useless. How could you have released this app when it is so full of bugs it is unusable. I miss my Canadian news. Such a shame. I can't stand the redesigned. Called the customer service to cancelled, and was given 50% off. 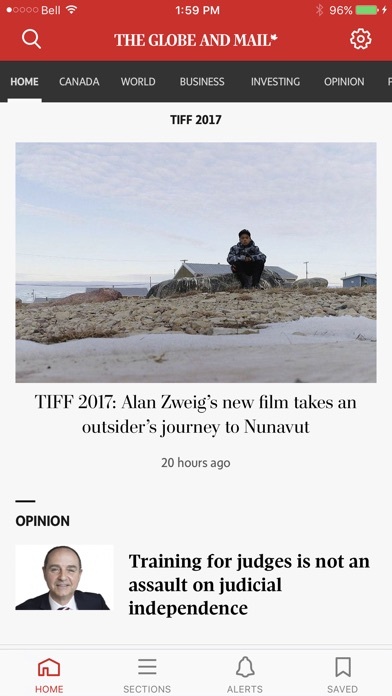 Globe and Mail is a premier news outlet in Canada, and this app allows the user to easily keep up with Canadian current events. This app has collapsed. Do not use it. Why did you people change the old app it was working fine. Now there is a quarter of the content and the design is horrible. Made me cancel my subscription. 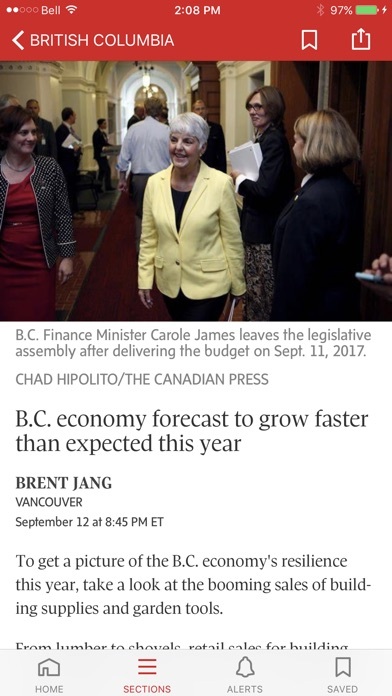 I live in the states, but the Globe and Mail still my go to source for all news, particularly financial and international. I loved the old interface; the new one is good, but can take a bit of time to load. That said, there is no news app I go to or trust as much as this one. The Globe is among the very best of North American journalistic enterprises, and the capabilities of their app is evidence of this commitment to quality. Easy to navigate. Provides excellent access to the Globe and Mail. This is not a pro-democracy app. Editors of Globe and Mail: "You can only read, you shall not comment on our content." What is this if not cowardice and one-sidedness? If I find a piece of news worthy of discussion or on occasion incorrect representation of the facts (such as the US falsifying the numbers about it's commitment against climate change! ), why should I be barred from posting my comments? I’m a subscriber who normally accesses the G & M on my desktop computer. I saw and downloaded this app to my iPad, logged in with no problem — but clicking links on homepage takes me to screen stating content isn’t available. Come on G&M you are better than this. This new layout is all stylistic bs vs substance. Please go back to the old layout so we can easily find your great content! Outstanding app provides access to to notch reporting and content. Excellent real fact based news, excellent user interface. Uses little battery and not much data and works flawlessly. My absolute favorite, bar none, no exceptions. Highly recommended! It crashes. It's hard to find content. Then, it crashes again. If you ask for help, they tell you to look at the full website to find the content you want. They even added an iOS learning guide (42.9 MB!) that tells you it's an over-engineered disaster. Don't waste your time or money. 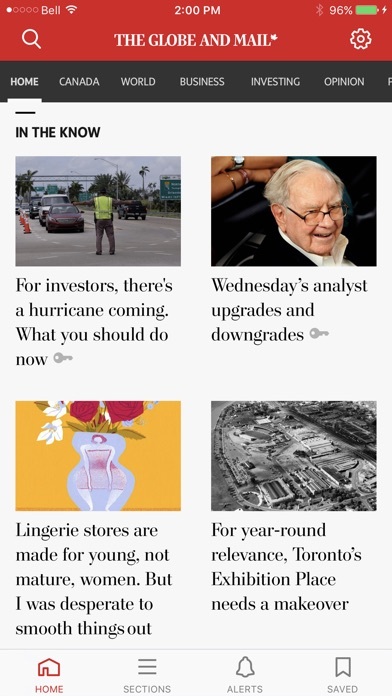 The app is a bit slow to load and requires internet connection to read the articles. I'd like less attractive graphics if it could be faster and store a copy on my phone to read anytime. Lots of problems have existed with this app forever and they never get fixed despite major overalls. For instance, if you click on a notification, usually it won’t actually take you to that article. It just takes you to the main page. Really. What’s the point of having those alerts? It’s almost as bad as the website. Wish I could give zero stars. The newest update is soooooo poorly designed that I initially thought it was a temporary spoof or prank! Can't find any subsections, can't navigate to stories. . . And when I find something to read, it crashes. I do like the clean uncluttered look--although it is uncluttered because they took the content away! If this is not fixed within the next few days, I'm canceling my paid subscription. Update: I called and tried to cancel my subscription. However, they bribed me with a 25% discount and I relented and kept it as I do read the paper online also. So, they bought themselves a reprieve with the bribe!! If they don't fix the app soon, I'm outta here!! This app is slowly improving and I have faith that it will get even better and earn a 5 star which is what the Globe and Mail deserves. There have been a lot of technical glitches but movement through the app is much better. The articles are great and give a good insight into the Canadian experience. Drunken monkeys could have designed a better interface. It is confusing to navigate, difficult to scroll through, and takes mental gymnastics to link quotes / photos / headlines with stories. The editor's comments about the redesign are nonsensical gobblygook! Ughhhh.....so bad! Too much of it is locked. The subscription fees are too high for news you can get on the internet elsewhere. Your is deleted.